Chandani Patel is Assistant Director of Faculty Programs and Services at the CTL, where she develops and facilitates pedagogical workshops and offers professional development services for faculty, postdoctoral, adjunct, and other instructors at Columbia. She focuses particularly on diversity and inclusive teaching initiatives, active and collaborative learning, and peer-to-peer mentorship. 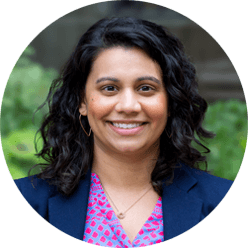 Previously at the CTL, Chandani served as Assistant Director of Graduate Student Programs and Services, offering workshops and consultations on inclusive teaching, building teaching portfolios, and student-centered pedagogy and course design. Chandani is committed to fostering diverse and inclusive teaching and learning environments and to advancing a more equitable higher education landscape. Prior to joining the CTL, Chandani was Assistant Director at the Chicago Center for Teaching at the University of Chicago, where she designed and offered programming to support graduate students and postdocs in their teaching and professional development activities. There, she managed a team of Teaching Consultants, provided workshops and consultations on teaching materials for the academic job market, and oversaw the Excellence in Course Design Award and Certificate in University Teaching. She also led a number of diversity and inclusion initiatives in partnership with UChicagoGRAD, the Race and Pedagogy Working Group, and the Diversity Advisory Board. At Chicago, Chandani taught in the Readings in World Literature Humanities Core sequence and served as a Resident Head within the College Housing system. Chandani received a Ph.D. in Comparative Literature from the University of Chicago, and she holds a B.A. in Comparative Literature and an M.A. in Humanities and Social Thought from New York University. Her scholarly work focuses on the Afro-Indian Ocean, with particular attention to the literature of South Asians in Africa, as well as on literary connections between the Indian and Atlantic Ocean worlds. She currently sits on the Academic Council for the South Asian American Digital Archive. In addition to her professional roles, Chandani enjoys reading fiction, running, and exploring the wilds of New Jersey and New York with her husband, her daughter, and her dog.